The judgment of the case filed by the General Secretary of the JVP Tilvin Silva on 24th July 2008 against the book published by Parliamentarian Wimal Weerawansa using the documents of the Central Committee of the JVP was released by the Commercial High Court of Colombo today (11th). The Magistrate Ruwan Ferdinando ordered the defendant to provide all the relief sought by the complainant. 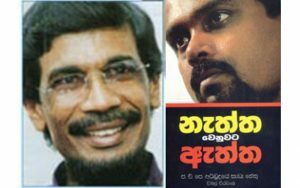 The Court ordered that all the documents with which Weerawansa had based his book on belonged to the complainant under Intellectual Property Act and they should be returned to the complainant, as the defendant had violated the Intellectual Property Act he would have to pay Rs.10 million as compensation, to calculate the money received from the sale of the book and pay the complainant an amount for statutory loss and also to pay legal costs. A team of lawyers led by Attorney at Law Paul Ratnayaka represented the General Secretary of the JVP.